HISTORY OF SAINT MATTHEW'S LODGE, by Bro. William Odlin. We are in the midst of a celebration to commemorate the fact that this Lodge has survived the vicissitudes of one hundred years, and l have been drafted to deliver an historical address. St. Matthew's Lodge was born in the shadow of the only persecution to which Masonry has been subjected for several hundred years. We may think the century of our life long. What should be our wonder and sacred reverence when every time we receive a notice from our Secretary we see staring us in the faee the date A. L. (year of light) 5922. If you love St. Matthew's Lodge, with what a surge of tenderness you must think that to you is given the keeping of the inheritance of your predecessors for fifty-eight centuries before St. Matthew's Lodge was founded, which on your oaths you have sworn to preserve without. change as you receive it, and what a mighty responsibility that you will preserve it absolutely and hand it on unchanged to your successors - what a privilege. Baked in clay cylinders, cut in cameos, inscribed in military fortifications and cathedrals, temples designed and built by your ancestors in the Craft, the square and compasses is the oldest, most continuous fact of all history, The great religions of all times, the Buddhists, the Pythagoreans (and to this school belong Socrates and the Greeks) and last but by no means the least and by far the oldest, stretching back by our own calendar to an unknown date before the year one, are the Magi, those who believing in the Prophet Daniel, the chief Magus of the world for a lifetime, followed the star of Bethlehem and laid their offerings at the feet of Jesus Christ in the manger. The English Grand Lodge was organized in London in 1717. In 1733 Henry Price, Esq., of Boston, received from Viscount Montague, then Grand Master of England, a deputation creating him "Provincial Grand Master of Free and Accepted Masons in New England" and charging him with the duty of extending the new organization among the Craft in this region. In this year Major Price organized. a Grand Lodge and began the work of creating subordinate lodges. There were many Masons in New England at that time. The Royal Governor Belcher was very zealous. He retired and became Royal Governor of New Jersey and in a letter written upon the occasion of his retirement as Royal Governor of Massachusetts, stated he was made a Mason in 1704, and he was, so far as I know, the earliest made Mason in New England of whom we have any record proof. This Grand Lodge seemed to be generally accepted as the head of Masonry in New England until 1769. Joseph Warren, the patriot, was raised in St. Andrew's Lodge, Boston, September 10, 1761. In 1769 St. Andrew's Lodge joined with two Lodges connected with British regiments quartered in Boston and sent a petition to the Earl of Dalhousie, Grand Master of Scotland, for a District Grand Lodge, and on May 30, 1769, there was received from the Scottish Grand Lodge a Commission appointing Joseph Warren, Esq., Grand Master of Masons of Boston (New England) and within one hundred miles circumjacent to the same. Warren and his associates granted Charters to various Lodges and were in conflict with the older Grand Lodge for years. Also, in 1782, one Moses Michael Hays, a Jew and a merchant of great wealth, came out from England with a patent constituting him Grand Master of a Grand. Lodge of Masons in America with power to charter subordinate Lodges! (Hays' Commission was a Scottish Rite commission.) This is a reflex of the internal dissension of English Masons during the same time. The Grand Lodge organized in London in 1717 was not accepted as supreme, although widely accepted by Masons throughout the kingdom. The York Masons refused to come in, so likewise the Scottish Masons. The troubles of Massachusetts, while of deep interest, cannot be treated of in the time at my disposal. Suffice i to say that the rival Grand Lodges had completed their union on March 5, 1792, and since that date the Grand Lodge that we know has conducted its affairs with great dignity and honor to the satisfaction of the Craft. The disagreements in England are of absorbing interest but suffice it to say that the child born in 1717 in London with many vicissitudes be it said, grew and waxed strong and it is of particular interest to St. Matthew's Lodge that the London Grand Lodge obtained universal recognition of its primacy it 1822, the year of your birth. St. Matthew's Lodge was granted its Charter on December 11, 1822. Its Charter spells the name with one "t'". I wish this spelling might never be departed from. So we were christened, so may we live, and so we have become an integral part of the mysteries which will never die even if Andover shall disappear from the face of the earth. In 1822 Andover had not more than two thousand inhabitants, and twenty six members, or thirteen per thousand, was not a large membership; but when we consider the distance between habitations and the difficulties of travel it looks better. However, of these twenty-six members the only History of Andover, namely, that written by Sarah Loring Bailer, which is really a very complete and well done History, mentions only one, to wit John Smith. It would be a work of loving memory to trace the descendants of our progenitors, and most interesting. In 1692 Andover was the scene of a violent witchcraft explosion and several inhabitants of the town were executed, one being Samuel Wardwell. There were two Wardwells in our twenty-six Charter members and our curiosity is great to know if our two Brothers were descendants of the executed man, but time is lacking and also knowledge to do more than touch on those of whom we are fortunate enough to have definite knowledge. Our Charter was the fifty-fifth granted by the Grand Lodge and is the oldest one in the present Eleventh Masonic District. Of the fifty-five charters in existence on December 11, 1822, about forty-three have disappeared; only about twelve have survived including that of St. Matthew's. Why this astounding mortality? The first meeting of record was held at the home of Mary Parker in the North Parish, now known as North Andover, January 22, 1823. I am told on the best of authority that this building is now standing on the corner of Andover and Chestnut Streets, North Andover. The meeting was, as was the custom in those days, opened on the first degree with sixteen members and seven visitors present. It was raised to the second and then to the third degrees. In those days ail of the business of the Lodge, with the exception of the initiation of the candidates, was done on the first degree in striking contrast to our present system of doing it all on the third degree. Then, as now, the candidates were initiated with the Lodge open on the corresponding degrees. The Lodge had been in existence only a short time when a search for new quarters nearer the center of the town was made. On December 10, 1823, David Rice and William Bond were chosen as a committee of two to obtain from Good Samaritan Lodge, of Reading, a permit to move to what was then known as the South Parish. This petition was refused, but the reason for not granting it is not evident. Another effort to get the waiver of jurisdiction from the Reading Lodge was soon made and with better success. At a meeting held March 10, 1824, a committee was appointed to secure a room near Andover Bridge and at a meeting held May 12, 1824, it was voted to move to Towne's house. To meet the cost of moving each member was assessed forty cents. The Lodge soon outgrew these quarters and at a meeting held February 1, 1826, a committee was appointed to consider the erection of a building in the South Parish. At the meeting of February 22, 1826, the committee reported that it had taken measures to erect a building in which the Lodge could be accommodated and at the meeting on June 21, 1826, which was held at the home of Brother Locke, it was announced that the Grand Lodge had granted a Dispensation to move to the new building. This building was evidently erected and owned by the St. Matthew's Masonic Association which was an organization made up of members of the Lodge for the purpose of erecting the building which, so far as I can find out, was put on the present site. The Association existed for about ten years, but appears to have been unable to meet with financial success as it gave several notes to the bank. Its records are not cornplete and it seems likely that the bank was forced to take the building to get its money. This building was known as the Union Building, and the first meeting was held there July 19, 1826. The Dedication took place September 13, 1826, and J. Bartlett, of Marblehead, D.D.G.M. for the Second District, delivered the dedicatory address. A banquet was also held. The hall was hired for one year from November 10, 1827, for twenty-five dollars. So far as the records seem to show the Lodge had these quarters until January 16, 1843, when it is recorded that the Lodge left the Union Building. There are many instances recorded in the minutes where the meetings between 1826 and 1843 were held at the homes of various members The January 16 meeting was held at the home of Merrill Pettingill, who was Master at that time, and it was voted to continue as soon as a room could be secured. At the meeting of February 14, 1844, a committee was appointed to see about hiring the Odd Fellows' quarters and at the next meeting it was reported that they could be had with light and heat for fifty cents per evening, and it was voted to accept them. The first meeting was held there January 28, 1844. In 1852 there were difficulties over the rent or something else and the members voted to vacate the hall and hire one owned by Nathan Swift for a period of five years. The first meeting was held there April 28, 1852. The Lodge continued in Swift's Hali until 1857. At the meeting of November 20, that year, it was voted to move to the bank hall which later became known as Masonic Hall. February 11, 1878, a lot of new furniture was purchased for the Lodge-room. These quarters were used until 1899 when the erection of the present building was started. At a meeting held December 10, 1898, a committee of three, composed of Worshipful Brothers George S. Cole and A. S. Manning and Brother C. E. Abbott, was appointed to confer with the bank people regarding the renting of quarters in the new building. March 25, 1899, it was voted to secure Grand Army Hall during the process of constructing the bank building. In the record of the meeting of February 2, 1890, it states that the terms of the present hall are to be three hundred dollars per year, payable monthly. In order to furnish the new quarters a vote was passed empowering a committee to spend twelve hundred dollars for the purpose. Some of this money was raised by subscription and the balance taken from the treasury. Two hundred dollars was appropriated to dedicate the new hall. The first meeting held in the present quarters took place April 28, 1890. In 1826, one Captain William Morgan had prepared what was called an exposé of Masonry. What purports to have been so prepared by Morgan was published by a Colonel Miller; a reprint can be purchased at almost any second-hand book store for twenty-five cents. When it became noised about that such a book was to be published Morgan disappeared. He was never again seen alive, but in the fall of 1827 a body was found on the shores of Lake Ontario and certain parties were tried and convicted, and the public believed and the trial seems to prove that certain Masons of Batavia, Le Roy, and Rochester, in New York State, took Morgan in a boat to the mouth of Oak Orchard Creek, tied a rope heavily weighted with sinker around his body, and threw him overboard. I am making no allegations or admissions, simply presenting the matter as it appeared' in the public prints. A great outcry arose against Masonry throughout the country. This was only four years after the institution of St. Matthew's Lodge. Agitation began at once. Thurlow Weed, the celebrated New York newspaper man, was one of the most rampant of the attackers of Masonry. To a considerable degree he made his great newspaper success out of the matter and laid the foundations of his remarkable political power which lasted, if possible, beyond the grave. The agitation was continuous and cumulative all over the United States, but I can only touch on what happened near home. On December 30 and 31, 1829, and January 1, 1830, there was held an Anti-Masonic State Convention for Massachusetts in Faneuil HalI, Boston. I have a printed copy of the proceedings published in 1830, by John Marsh, for sale at the Anti-Masonic Book Store, 96-98 State Street, Boston. It was at this convention alleged the Masonic oath was to "keep his secrets inviolable when communicated to him as such, and he knowing them to be such, murder and treason not excepted." "We would not impute to Masons, or make them responsible for the contentions and mischief that is [sic] occasioned by designing men, for political or sinister purpose; but they certainly owe it to themselves to inquire if it would be consistent with the elevated character they sustain, for them to refuse to put a stop to the evils referred to, since they alone can do it, by relinquishing the institution which has caused them. "This committee cannot but come to the conclusions that the Masons owe it to the community, to themselves, and to sound principles, now to discontinue the Masonic institutions." Massachusetts followed on and an investigating committee was appointed which reported in public document, House No. 73, in 1834. This was surely the winter of our discontent. Memorials were presented to the Legislature signed by many thousand of our citizens "praying for a full investigation into the nature, language, ceremonies and form of rehearsing extra-judicial oaths in Masonic bodies, and if found to be such as the Memorialists described them, that a law be passed prohibiting the future administration of Masonic and such other extra-judicial oaths as tend to weaken the sanction of civil oaths in courts of justice; and praying also for a repeal of the Charter granted by this Commonwealth to the Grand Lodge of Massachusetts. " The printed documents state the memorial was signed among others by E. Porter, Leonard Woods, Moses Stuart, Thomas H. Skinner, and other citizens of Andover. The first three were Professors in Andover Theologicai Seminary, and I think Skinner was principal of what was called the Free School in the North Parish, now North Andover. Professor Porter was particularly noted for his kindness and consideration for a black but comely faithful domestic for thirty years, and a stone in the graveyard on the hill says she died in full Christian hope. Leonard Woods was the leader of the Andover Theological Seminary, dying in 1846. He it was who conceivecl the idea of the American Board of Foreign Missions and who prayed in the woods where there is a commemorative table erected at Rabbit's Pond. Moses Stuart was his life long associate and friend. These men made the greatness of Andover Theological Seminary, now unfortunately a thing of the past, but St. Matthew's and Masonry, which they tried their hardest to kill, go marching on. These men were widely known and had an influence much beyond that which ordinarily comes to theological professors and I have always felt it rvas largely due to their leadership in the popular attack on Masonry. The points of attack are well shown by my quotations as to extra-judicial oaths, the character of the oaths themselves, the brother-protection sworn to above country and above church or law, and above all their political activities. In the Revolution the American Union, Lodge was chartered by St. John's Grand Lodge and when with the army near West Point its records show that Brother General George Washington and part of his staff visited the Lodge. I love to think of this and also of Captain Hall, a lieutenant on the Ranger and Bon Homme Richard, under John Paul Jones, who was a Mason, and to think that perhaps a Lodge was convened under the shadow of Albion's Hills. Our Revolutionary forbears were Masons. The Masonic Lodges were hotbeds of revolution and the organizations were used to the limit for revolutionary purposes, and thus naturally our country started its course as a ship of state under Masonic influence. The claim was in the 1830's that this influence had grown and so had the order. That the order was no longer the approved institution of Washington, Hancock, and their like, but was full of inferior men, that it was political to keep Masons in office, etc. To a large extent this seems to have been true, and anyway this movement against Masonry culminated in 1835 and almost all Masons who were candidates for political office were defeated. This is the world into which St. Matthew's was ushered in 1822 and through which it lived. The majority of its sister Lodges succumbed. Worshipful Brother Merrill Pettingill kept the charter buried in his cellar in 1836, 1837, and 1838. Annual meetings were the only ones held. They probabty did not dare meet any oftener. These three men carried on through all attacks and adversities. Unfortunately little is known of Pettingill. John Smith came from Brechin, Scotland, in 1816, to Medway, Mass., and was employed as a journeyman machinist. He had two fellow employees, Joseph Falkner and Warren Richardson, who were Andover men. I am unable to determine whether or not they were Masons. These three in 1822 went into business together to make machinery and started in Plymouth, but moved their business to Andover in 1824. It is evident that Smith was close to Andover through his partners before his business was brought here. It is also strange that his partners were not associated with him as Charter members of the Lodge, if they were Masons. Peter was John's younger brother, and came over from Scotland in 1822 and went to work in the machine shop at Plymouth and apparently came to Andover when the business was moved here. What must have been the atmosphere of the town with the great and powerful Professors Woods and Stuart and undoubtedly all the social, business, and church power arrayed against St. Matthew's Lodge, and the indomitable will of the two Smiths struggling to get a business start, and Pettingill secretly preserving and practicing Masonic rites, true to their oaths to preserve the mysteries and secrets and pass them on to you and future generations complete and exact? Worshipful Brother Holmes of St. Matthew's Lodge, has collected with great pains, accuracy and research all the facts of our history. His work ought to be preserved and encouraged. He most generously gave me the benefit of his material. It is remarkable how meager is the information obtainable about Masons from the records of the Lodge and what little care is taken to pass on to the future most desirable information. We never appreciate this until an attempt is made as now to give some historical account of what happened one hundred years ago. I hope St. Matthew's Lodge will take the steps necessary to protect and preserve its existing records and that a complete record of every initiate will be prepared and kept, giving his ancestry, his business, his marriage, and that it will be made the duty of every committee on resolutions on the death of a Brother to prepare with care a biography to be made. a part of the Lodge records. I have for some years felt a call to arouse in Masons an appreciation of their sacred duty as the depository of the oldest inspired truth in the world. May it please God if I am able to inspire in your breasts any appreciation of the divine origin and miraculous life of Masonry and that you will at our altar renew your vows to preserve the same intact and pass the vow on to future generations pure and undefiled. By Worshipful Brothers Nathaniel Stowers and J. Lewis Smith. will never do anything to be remembered by their descendants." The officers and members of St. Matthew's Lodge, Ancient, Free and Accepted Masons, take this opportunity to welcome its many friends and Brothers to this "public" celebration of its one hundred and twenty-fifth anniversary, and to present a short history of the Craft, particularly as it pertains to our Lodge. Only a magic glimpse into a crystal globe, or a grand stirring of the dim and distant dust of unrecorded times could reveal the exact origin of our Fraternity, but there is no doubt it began centuries ago as a group of active, operative Masons, gradually changing to speculative, or philosophic Masonry, with modern Masonry usually reckoned from the formation in London, in 1717, of the original "Grand Lodge of Free and Accepted Masons." Hence, the earliest settlers brought it to our shores. Ardent Brothers like Washington, Adams, Franklin, Patrick Henry and John Marshall based our Constitution on its principles of Freedom and Justice, Liberty and Equality — and certain famous Indians who once dumped tea in Boston Harbor are said to have been members of the Craft. From such a cradle, with such inspiring forebears sprung our Lodge. For it is recorded that in 1818 one David Rice and thirteen other Masons petitioned the Grand Lodge for a charter for "Minerva" Lodge in Andover; but when the petition was granted, on December 11, 1822, the name was changed. It was the fifty-fifth charter granted by the Grand Lodge of Masons in Massachusetts. It designated the area of jurisdiction as Andover, No. Parish, . . . and the name of the Lodge was spelled Saint Mathews' (one "t"). However "Saint" soon became "St.," the apostrophe rambled around or even went on vacation, and "t's" were added or subtracted at the whim of succeeding Secretaries; no one knows when, if ever, we officially became St. Matthew's. and Widow Parker's, which was probably a Tavern, still stands on Chestnut Street, near Andover Street, in North Andover. To give a full account of all the "doings" and various Brethren of St. Matthew's Lodge in the time and space here allowed would be impossible. Indeed, the written records are merely prosaic minutes shedding but little "light" on the part Masons and Masonry have played in great events or in our town. But choosing what seem to be the highlights from available records and memoirs in the archives of the Lodge, it is interesting to note the following: at first, meetings were held as early as one-thirty in the afternoon, but most frequently at five o'clock, and it was not unusual to confer all three degrees at one session. Later, it is said the Lodge met "on the first Monday following the Full of the Moon." In June, 1844, a Lamplighter was voted a regular officer of the Lodge; and judging from various bills, "brandy" was a regular attendant at early meetings, being outlawed in favor of lemonade by vote of June 24, 1832 — eighty years before Mr. Volstead appeared upon the scene. The place of meeting was not at first recorded, but in 1824, a "committee was appointed to superintend the removal of the Lodge to Win. Townes Hall, near Andover Bridge" and members were assessed forty cents each for cost of same (?a day's pay). Meantime, there were several petitions for change of jurisdiction to the South Parish, which was finally granted, and another committee was chosen to "report on measures to be taken for accommodation of the Lodge in the South Parish." This committee met at the home of Brother James Locke (Locke Tavern, 111 Main Street) in 1826 and formed the "St. Matthew's Masonic Co." which issued shares and bought land "sufficient for a building 50 feet long and 26 wide from Capt. Stephen Abbott and David Holt, between the shops of Messrs. Nicholas Wilson and Benjamin (?) Condon" for the price of $125. The "Company" thereupon erected The Union Building, and on Wednesday the 13th of September, in 1826, dedicated the Masonic Hall therein, on the site now occupied by the Lodge. However, the enterprise did not prosper, and the Lodge soon became tenant of the Andover National Bank, remaining such until the present day. Records show that "a handsome portrait of our distinguished Bro. Gen'l Lafayette ornamented the West end" of this Hall, but all that now remains of the venture are a few marble ashlers rescued when the building was torn down; and the Lodge did not again hold property until 1922, when the Flint estate on Elm Street was acquired, now occupied by the Square and Compass Club. The present lodge rooms were dedicated May 30, 1890, and Thomas David, whom many of us remember as an ardent Mason and Scotchman, was the first to be raised to the sublime degree of Master Mason, with Worshipful Albert S. Manning in the East (Smith & Manning, Grocers, formerly on Essex Street, opposite present movie house). During the 1830s, when there was widespread but unfounded suspicion of the Fraternity, it was necessary to suspend regular meetings of the Lodge, but it is the proud boast of St. Matthew's that its original charter was preserved intact — buried, so tradition says, in the cellar of Worshipful Merrill Pettengill, a blacksmith whose shop was located on what is now Punchard Avenue. Worshipful Brother Holmes in his memoirs reports that E. Porter, Leonard Woods and Moses Stuart of the old Andover Theological School were among those who mistakenly tried to destroy the Craft, yet Saint Matthew's continues on while the Theological School has long since departed. Brother Merrill Pettengill and Nathan Frye, of Frye (now Shawsheen) Village, were Masters of the Lodge on three occasions, for a total of thirteen years each. Seven Smiths have occupied the East, our present Secretary, Worshipful J. Lewis Smith, being the grandson of Peter, whose brother John was a charter member and the last of such members to pass away. The first recorded Masonic burial was held at Methuen on January 30, 1824, for Brother Stephen S. Bradford, whose widow received the first recorded assistance ... a "collection" of $42.11. Unfortunately the Lodge was not born soon enough to assist Grand Master Paul Revere in laying the cornerstone of the capitol of Massachusetts on Beacon Hill, but it was present at similar ceremonies on June 17, 1825, at Bunker Hill, and in 1826, laid the cornerstone of West Parish Church with "Masonic Honors." Cochichewick Lodge of North Andover was constituted on the 24th of June, 1875, and the occasion was a "grand holiday for the Town," St. Matthew's presenting the new offspring a Bible. Times have changed since Masonry played such a prominent part in public affairs, but we can point with pride that a great majority of the principal officers of our Town have been, and still are, members of the Craft. Probably the most interesting, certainly the most unusual meeting of St. Matthew's was held in June of 1947, when, after appropriate preparations and precautions, the ritual of the Third Degree was presented in most dramatic fashion on the stage of Memorial Hall, with more than four hundred members and visiting Brethren seated in the Auditorium. Probably no other tegular meeting in our history was so well attended, or so highly commended. The average attendance the first year of the Lodge was twenty-three; last year, sixty. The original twenty-six members have increased to more than four hundred, and no one living can now recall all the Brethren who have "fallen like Autumn leaves" along the way. Surely great progress has been made, both in our Lodge and in our Land, since that day in December, 1822; yet the farmer by the side of his oxen was as contented then as the modern tiller riding his iron steed, likewise the tradesman and the clerk. Despite the outward changes and material progress witnessed by the sands of time, it is apparent that true happiness is dependent on the fundamental Masonic virtues our forebears professed. In emulation of them, may we so live that those who celebrate future anniversaries can look back and say of us — "They, too, exemplified the principles for which the Founders stood." During the 1810's a group of Andover citizens formed with the purpose of organizing a Masonic Lodge in that town. It appears that this formation was known as the Wiltshire Society of Freemasons; but very little is known of this early organization. The first petition to the Grand Lodge of Massachusetts, recorded on December 9, 1818, was for a Lodge to be known as "Minerva." This first petition was denied but the Brethren resubmitted their request on September 11, 1822. This petition was successful and the 55th Charter in the history of the Grand Lodge of Massachusetts was granted to Saint Matthew Lodge on December 11, 1822. It is interesting to note that for some unknown reason the name Saint Matthew was substituted for Minerva on that same date. One of the brethren recorded as a visitor was cited on the Charter as a founding member. Two of the brethren recorded as members were not recorded on the Charter. There is no previous record of an election or installation and yet the officers were in place. There is no previous record of a By-Law Committee and yet the By-Laws were available and were signed by some that evening. The first year of the Lodge's existence was extremely busy in that eighteen brethren received all three degrees and five brethren affiliated with the Lodge in the eighteen meetings held. The dues were established at 37 1/2 cents per quarter and visitors were charged 12 1/2 cents per meeting after their first visit which was free. The dues were lowered in 1825 to 25 cents per quarter. In 1824 the Lodge moved from the Widow Parker's House to Mr. Towne's House near the Andover Bridge (each member was assessed forty cents for the move). The Saint Matthew's Masonic Company, formed in 1826, constructed the Union Building and the Lodge took up residence there in 1826 and remained until the Anti-Masonic period of the 1830's. New memberships dropped off during the 1830's and the Lodge was forced to go underground; however, the Charter was never surrendered. At least an annual meeting was held during these trying years and this fortitude resulted in the fact that Saint Matthew's Lodge became the 12th oldest Lodge in the State with an uninterrupted Charter. On January 16, 1843, thirteen brethren voted to continue the activity of the Lodge and in February, 1844, the meetings were moved from members' homes to the Odd Fellows Hall (the old Union Building). The Lodge almost ceased to exist again in 1853. The membership and activities had fallen off but on April 28, 1853, the thirteen members present at the meeting elected to continue. As envisioned by these few members, the Lodge's prosperity-did pick up during the Civil War and Reconstruction periods and an active Lodge celebrated its fiftieth anniversary in December, 1872. Saint Matthew's Lodge expanded its activities in 1878 to include women in holding its first Ladies' Night in February of that year. The records show that many family functions have been held since that time. Many innovations in the conduct and content of the Lodge meetings took place after the turn of the century. Music started to play an active role in the degree work, refreshments were served after most meetings and talks, lectures were introduced as post-meeting activities. Several of these practices are still enjoyed today. The year 1902 marked the first Saint John's Sunday (June 22) and the appointment of the first District Deputy Grand Master from Saint Matthew's Lodge. His first visitation to his Lodge on November 21, 1902 included a luncheon, the Lodge meeting, and a banquet with music which entertained 430 brethren at the Town Hall. The Lodge purchased the Flint property in 1922 which was used by the Square and Compass Club for many years and then converted into the present Temple grounds. In 1922 the Lodge also celebrated its 100th anniversary with a three-day affair. (1922 Mass. 382-399) There was a church service on December 10, a Special Communication on December 11, and a banquet, social hour, entertainment and dancing on December 12. Despite the activity of the Lodge, the number of candidates dropped off in the '30's. Consequently, Wor. William Allen sponsored a Watch Night (New Year's Eve) party in 1934 and 1935 which was designed to show non-members the type of activities which could be enjoyed. These events were successful; however, the number of new members brought in was minimal. The postwar years did see an eventual rise in membership. Since the granting of the Charter, Saint Matthew's Lodge has served under 85 Masters, including our present Master, Wor. James F. Johnson. The Lodge has had the privilege of having five of its members appointed District Deputy Grand Master. It is hoped that the next 150 years will be as interesting and rewarding as the first one hundred and fifty. The officers and members of Saint Matthew's Lodge, A. F. & A. M., are proud to have presented this short history of the Craft, particularly as it pertains to our Lodge. Mere words cannot adequately express our thanks to Wor. Robert A. Domingue, who has graciously consented to the use of these excerpts from his forth-coming book which he hopes to have published in the near future. To fully appreciate the heritage of Saint Matthew's Lodge, we must briefly follow the evolution of organized Freemasonry in Massachusetts. In 1733, Henry Price apparently received a commission in London from the Grand Master of England, Viscount Montague. Upon returning to Boston, he organized his Provincial Grand Lodge on July 30, 1733; it was known as the St. John's Grand Lodge. The First Lodge of that organization, now known as Saint John's Lodge, was constituted on August 31, 1733. In the early 1750s, a group of brethren met at the Green Dragon Tavern and formed a Lodge later known as St. Andrew's Lodge. In 1754, they petitioned the Grand Lodge of Scotland for a Charter and received it on September 4,1760. A petition was granted by the Grand Lodge of Scotland on May 30, 1769, to appoint the Most Worshipful Joseph Warren, Esquire, to be Grand Master of Masons in Boston, New England and within one hundred miles of the same. This second Grand Lodge was called the Massachusetts Grand Lodge. After many meetings and discussions, the two Grand Lodges united on March 5, 1792, forming the "Grand Lodge of the Most Ancient and Honorable Society of Free and Accepted Masons for the Commonwealth of Massachusetts". Prior to this time the Massachusetts Grand Lodge had chartered 30 Lodges and the St. John's Grand Lodge, 44 Lodges, each was allowed to retain its original Charter and to take precedence according to seniority. Only eighteen of these Lodges remained or elected to become part of the united Grand Lodge with two-thirds of them having been associated with the Massachusetts Grand Lodge and one-third with St. John's Grand Lodge. St. Andrew's Lodge did not join the union and worked independently under its Scottish Charter until 1809 at which time, it, too joined. By September 1822, the Grand Lodge of Massachusetts had constituted one hundred and four Lodges and at their September 1822 Quarterly Communication, two more petitions were presented - Minerva Lodge in Andover and Warren Lodge in Amesbury. During the December 11,1822, Quarterly Communication, Saint Matthew's Lodge (a name substituted for Minerva Lodge at that meeting) became the 105th Lodge Chartered by the Grand Lodge of Massachusetts. When the pre-existing Lodges were considered, Saint Matthew's was 122nd in precedence; by 1870, this position had advanced to 56th because some Lodges had gone dark and never recovered, had failed for other reasons, or had become part of the Grand Lodge of Maine when it was formed in 1820. The petition presented to Grand Lodge at the September 11, 1822, Quarterly Communication was the second such plea for a Lodge in Andover. At the Annual meeting of December 9, 1818, "A petition signed by David Rice and thirteen others praying for a Charter to establish a Lodge in the Town of Andover, by the name of 'Minerva' was read and committed to" committee. Good Samaritan Lodge of Reading objected to the establishment of this Lodge and encumbered the decision of the committee. The minutes of the December 28, 1818, Grand Lodge meeting state "The committee to whom was referred the petition of David Rice and others, praying for a Charter, to establish a Lodge in the Town of Andover, were discharged from the further consideration thereof. A new committee reported at that same meeting with a recommendation that approval be granted based upon the approbation of Merrimack Lodge at Haverhill, Mount Moriah Lodge of South Reading and the D .D. G. M. of the 2nd District with disregard for Good Samaritan Lodge's objection. This report and recommendation was rejected and the brethren from Andover returned home empty-handed. There is evidence that a Masonic gathering or organization existed in Andover prior to the request resubmittal in 1822 and most likely existed at the time of the 1818 petition. Entries in the early Treasurer's book refer to the Wiltshire Society of Freemasons with entry dates preceding that of the Charter / Dispensation. Unfortunately, details are few and the life span, members and purpose of this organization, have been lost to history. The few available notes do indicate that meetings were held at the home (or shop) of Bro. Merrill Pettingill - one of Andover's blacksmiths whose shop was on Punchard Avenue. Society funds were used to pay the travel expenses incurred by Bros. Peter French and David Rice in their trips to Grand Lodge -presumably to make contacts and present the petition. "In granting a Charter to St. Mathews Lodge and locating it in the North Parish of Andover, your committee are of opinion that the Grand Lodge deviated from its By-Laws and laid the foundation for their being violated by the eloquence of an advocate for the petition and led away into fairy land. The sweet delusion will be remembered by those who were subject to its influence. "Towns, boundaries and distances all disappeared by the powers of the mighty magician and nothing was perceptible but an unrivalled Masonic Temple rising in majestic splendor. The Grand Lodge was led to believe that in locating Saint Mathews Lodge in the North Parish of Andover, it would be farther removed from Good Samaritan Lodge in Reading than if it were located in the South Parish." Minutes of the first recorded meeting in the Secretary's book state: "The Saint Mathews Lodge met at the Widow Mary Parker's for the first time Jan. 22, 1823, opened on the first degree of Masonry." The business of this first meeting consisted of receiving four applications for the degrees of Masonry and Dedication of the Hall. The Orator for the dedication was Bro. Augustus Pomeroy who later affiliated with Saint Matthew's Lodge. Although a copy of his address was requested at a later time, it has not survived the years; the applications received on that date have also been lost. Dues paid by the members that first year were set at 37 1/2 cents per quarter (called quarterages). After a free first meeting, visitors to the Lodge were required to pay 12 1/2 cents per visit. The fee for Initiation was $15.00, Crafting was $2.00, Raising $2.00, membership $2.00, affiliate membership $2.00 and a Diploma cost $1.00, 25 cents of which went to the Secretary for filling it out. Members of the Clergy could receive all three degrees for a total cost of $2.00. The first year of Saint Matthew's Lodge was a productive one. Prior to the Lodge Constitution on August 21, 1823, a total of 18 brethren were initiated, passed and raised and 5 brethren affiliated with the Lodge. Cyrus Brown, John Gleason, Benjamin Gleason and Benjamin Lander were the first group of men to be ballotted upon - on February 19, 1823; they were also initiated that evening. Bros. Brown and Lander were the first to be passed (on March 5, 1823) and raised (on March 26, 1823). Bro. Augustus Pomeroy was the first member to affiliate (on April 23, 1823). Since there were only 18 meetings from January 22 to August 21,1823, and all 18 brethren received all three degrees, it is understandable that most meetings were quite full. It was not unusual for all three degrees to be worked on a single evening in addition to the conduct of a business meeting and balloting. The Lodge had its small troublesome areas that first year as well as the general prosperity reflected in the records. On May 21, 1823, the Lodge took up the complaint (unspecified in the minutes) against Bro. George French and voted to excommunicate him for the present. On June 18,1823, it was voted to choose a committee to see Bro. Spofford and to request him to withdraw for the present. "The Grand Lodge was opened in ample form and proceeded to St. Mathew's Lodge. A procession was then formed which proceeded to the Meeting House. The Lodge was then constituted and its Officers installed according to ancient form. The M.W. Grand Master delivered an appropriate charge to the Members of the new Lodge. After the ceremonies were closed, the procession was again formed and proceeded to partake of the entertainment provided for the occasion." The Lodge soon outgrew Widow Mary Parker's facilities and in 1824, efforts were made to locate a room near Andover Bridge. Bros. Lander and Frye were appointed to supervise the move to Mr. Towne's Hall near Andover Bridge; the first meeting held there was on June 9,1824. The following month it was voted to assess each member 40 cents to cover the moving expenses. As early as December 1823, a committee was appointed to meet with Good Samaritan Lodge to get their approbation to move Saint Matthew's Lodge to the South Parish of Andover. All attempts were unsuccessful over the next two years, but a petition was prepared for presentation to Grand Lodge regardless. As cited earlier, Grand Lodge recalled the irregularities of trying to restrict a Lodge to a section of the Town and recommended that Good Samaritan Lodge reconsider their objection. A change in heart was realized and the Charter was amended to include the entire town of Andover. In parallel with this Charter expansion effort, preparations were being made to move to the South Parish. By February 1826, it was decided to erect a building in the South Parish for accommodation of the Lodge and other purposes. The St. Matthew's Masonic Company was created to erect and maintain such a facility. The land was purchased for $125.00 and the Union Building, 50 feet long and 26 feet wide, was erected on that site which is now the location of the BankBoston Building on Main Street in Andover. The Lodge leased the third floor of this building for $25.00 per year and held their first meeting there on July 19, 1826. During that meeting, Capt. Stephen Abbott, one of the original owners of the land, was ballotted on, initiated, passed and raised. Dedication of the Hall occurred on September 13, 1826. Use of an Investigating Committee during these early years was the exception rather than the rule. By August 1825, a total of 73 applications had been acted upon, yet there were only three investigating committees invoked. All early applications were submitted in the applicant's handwriting, to a standard verbiage, on any available piece of paper - there were no prepared forms until 1859. Saint Matthew's Lodge made a first attempt at a Charity Fund in December 1825 when a committee of five was appointed to report on the possibility of a charitable fund. The resulting report was unfavorable and the concept was rejected. A committee of five was appointed to examine and try all transient applications for charity. A Charity Fund, per se, was not established until 1904. At the Annual Meeting of December 1826, the Lodge learned that it was in an embarrassing financial situation. The financial reports indicated an indebtedness of $180 and the Committee of Finance was authorized to hire $200 for the use of the Lodge. During the next year settlements were made on outstanding bills and attempts were made to retrieve the treasury balance from 1826, still in the hands of the former Treasurer. Another $100 loan was authorized in 1827 to pay for rent arrears, but a deficit of $55 was still reported as of the December 1827 Annual Meeting. That month it was voted to lease the Hall to the Methodists for use on Sabbath days (but not evenings) and by 1829, the Hall was being rented on a per evening basis at the rate of $1.50 to $2.50 per night. Attempts to levy an assessment to eliminate all debt were unsuccessful; rather, subscriptions were started and efforts made to collect all outstanding dues, or quarterages as they were then known. In 1830, a settlement was reached with the Treasurer of 1826 regarding the true balance due the Lodge from him. Discussions of a financial matter disappeared from the minutes after this date - possibly because all problems had been resolved, or possibly because the "Dark Period" presented more significant problems. The number of candidates and affiliates dropped from 1826 (1 affiliate and 22 candidates) to 1833 (1 affiliate and no candidates) with a slight reversal in 1831. This drop in candidates, as well as a decline in the meeting attendance figures, reflected the impact of the Anti-Masonic movement which was sweeping the country from the latter part of the 1820s to the early 1840s. As time progressed further into this Dark Period, there were some instances in which there were insufficient members present to even open the Lodge meetings. An Anti-Masonic state convention was held in Massachusetts in December 1829 and January 1830 which resulted in the appointment of an investigating committee. Memorials were presented to the state legislature calling for the repeal of the Charter granted by the Commonwealth to the Grand Lodge of Massachusetts. Signers of these Memorials included professors at the Andover Theological Seminary and the principal of the Free School in the North Parish of Andover. Notwithstanding, Saint Matthew's Lodge and her dedicated members made a valiant attempt to counter these charges, allegations and persecution.. On June 25, 1832, - a Monday - they held a St. John's Day procession and church service. The oppression, however, finally became too great and the Lodge was forced to "go underground". In September 1833, the carpeting of the Lodge Hall was voted to be sold. The Hall was given up in January 1835 and some of the furniture of the Lodge was offered for sale following a vote of February 1836. Subsequent meetings, few as they were, were held at member's homes. Throughout this trying period, the Charter of Saint Matthew's Lodge never left the possession of the Worshipful Master; most reports indicate he buried it in his cellar, others cite storage in his well. It is remarkable to note that the Lodge was able to maintain its existence in the face of the ever present and close-by adversaries at the Andover Theological Seminary. By 1845, the effect of the Anti-Masonic movement was all but forgotten except for the scars left in the minds of some and lives of others. The brethren of St. Matthew's met twice in January 1843 to see if the Lodge would commence work again. The thirteen members present at the first of these meetings voted to commence as soon as a suitable room could be procured. The Master's jewel was obtained from Wor. Bro. Merrill Pettengill who had served as Master from 1836 to 1843, as well as two two-term periods before then. He had moved from Andover and later established Mt. Tabor Lodge - in 1845. After several meetings in members' homes, the Lodge was able to secure a room in the "Od Fellowes Lodge" (in the Bank Building where they had previously met) and started meeting there in February 1844. New collars and sashes were purchased for the officers in November of that year. By March 1844, applications for membership and affiliation were flowing in to certify that St. Matthew's Lodge was again in full operation. On September 18, 1850, the first Past Master's Jewel of St. Matthew's Lodge was presented to Wor. Bro. Nathan Frye. At that time he had served as Master for five years and before he "retired" as Master in 1859, he had served a total of twelve and a half years. This tenure exceeded that of Wor. Bro. Pettengill by that one half year. As a result of rent problems, the Lodge sponsored a move to the third floor of Mr. Swift's Store Building effective April 1, 1852. This move, coupled with other innovations such as changing the meeting night, did not improve the sagging attendance and the brethren again considered dissolution. The thirteen members at the April 28, 1853, meeting held to discuss that subject voted to continue the Lodge for the present; those 13 members represented the total membership of 29 at that time. Another three years of inactivity ensued, but an upswing of candidates was observed in the early part of 1856. Improvements were made to the Hall, the lamps were upgraded from oil to gas, new collars were procured. In November 1857, the Lodge voted to move back to the Bank Building. St. Matthew's Lodge would remain in this facility from that time until they occupied their own Temple in 1965. The Lodge's celebration of their 50th Anniversary was apparently a very private affair. There are references to it in the minutes but no specifics were provided. The event was apparently held in December 1872 but no reports were found in area newspapers or in the Lodge archives. One of St. Matthew's historians, Wor. Bro. Joseph W. Smith, stated that appropriate ceremonies were held. The Lodge rooms were refurbished in the late 1870s with more than half of the expense being covered by subscription. In 1879, Grand Lodge voted to extend their capitation tax of $1.00 per year for each affiliated Mason for another 15 years; this tax had been established in 1868 to liquidate the Grand Lodge debt resulting from construction of their new Temple. The members of St. Matthew's Lodge objected strenuously to the continued imposition of this tax and was one of the last to commute (pay it off ahead of time as requested by Grand Lodge). Near the end of the 1880s, the bank officials decided to construct a new building on the present site and conferred with St. Matthew's members regarding a proposed hall in that new facility. The Building Committee secured temporary meeting quarters in the GAR Hall for the construction period. The first meeting in the new Hall was held on April 28, 1890. The Dedication, held one month later, was a gala affair complete with a full procession, ceremonies performed by Grand Lodge and a banquet for 300 in the banquet hall. Wor. Bro. Joseph W. Smith delivered a general history of the Lodge since its Chartering. The brethren of St. Matthew's Lodge apparently objected to centralization of Masonic charitable functions within Grand Lodge, for they opposed the creation of a Charity Fund at Grand Lodge level in 1897 and a year later voted against the Grand Lodge proposed Education and Charity Fund. As was the case with the Lodge's 50th Anniversary celebration, there are no records of the 75th Anniversary in the Lodge minutes. A full account, however, was recorded in the Andover Townsman of December 17, 1897. Held in the Masonic Hall and in the Town Hall, about 150 members and guests, including the D. D. G. M., participated in a reception, entertainment and banquet. Wor. Bro. Smith again delivered an historical sketch of the Lodge. On June 22, 1902, the members of St. Matthew's met to observe St. John's Sunday by attending divine services at the Baptist Church. This was the first celebration of this event since the Dark Period and was observed regularly for the next eighty some years. Following church attendance in the early 1900s, a collection was taken among the attendees upon returning to the Lodge room; this collection, which varied from $2 to $5, was then forwarded to the church attended along with a letter of thanks. The year 1902 represented the achievement of a significant milestone for St. Matthew's Lodge - for the first time, one of her members was appointed District Deputy Grand Master. In appreciation of this historical event, a gala affair was held on November 12 of that year to celebrate Rt. Wor. Albert S. Manning's first visitation - the Grand Master and the Grand Secretary were in attendance. A luncheon preceeded the meeting in which four brethren were raised to the degree of Master Mason. Following the Official Visitation and Lodge closing, a banquet was held at the Town Hall - starting at 10:05 P.M.; 430 Masons, representing 42 Lodges were in attendance. This practice of a large turnout for the D. D. G. M. Official Visitations continued for many years and it was not unusual for the attendance to be from 150 to 200. The banquets served at most of these functions were held at the Town Hall, Bernard Hall, or the AOUW Hall; for many, the St. Matthew's Orchestra furnished the music. By 1903, it was recognized that only five Past Masters in the Lodge had Past Masters' Jewels; in June 1904, this situation was remedied by presenting these jewels to six P. M.s thereby outfitting all living Past Masters with the proper jewel of their position. The first Past Masters Night was held on June 26,1893, and involved the raising of two brethren. The event did not become a regular affair until after the next Past Masters Night held in 1902. A Charity Fund was established by a By-Law change in 1904 which involved the setting aside of $1.00 of each members' dues for the Fund; the balance remaining at the end of the year was transferred to the ordinary funds of the Lodge. This Fund was voted a $1500.00 nucleus in 1907 and the By-Laws were changed to allow retention of the end-of-year balance. In May 1907, the D. D. G. M. visited St. Matthew's Lodge to explain the Grand Lodge establishment of a Masonic Home in the old Hotel Overlook in Charleton. Again, the brethren rebeled against centralized control and there were extreme difficulties in soliciting contributions to this project. Within the confines of St. Matthew's Lodge, however, there were actions to look out for the elderly of the Fraternity. In 1909, Bro. Charles W. Flint willed $ 1000.00 in trust to the Treasurer of the Home for Aged People in Andover, the income therefrom to be used for the benefit of the home, with the understanding that one of the inmates of the Home shall be named by St. Matthew's Lodge. The Lodge did not exercise this option until December 1913, at which time Mrs. M. E. Gleason was named to the home. Mrs. Gleason died in 1931 and the Lodge waived their right to name a successor until the next opening; no further actions followed. The collection of Past Masters' photographs on display in the lobby of the Lodge was started by Wor. George M. R. Holmes, Master in 1913-14, Marshal for 7 years and Secretary for 15 years. From 1913 to 1921, he expended a great deal of effort to gather likenesses of the 32 Masters who preceeded him. The results show he was extremely successful in that there is only one empty frame. He also compiled an extensive card index file of all Masons raised in St. Matthew's Lodge and presented it to the Lodge in November 1914; this file has disappeared from the Lodge archives. By 1920, the Lodge was again thinking of new facilities and an opportunity arose to purchase the Francis A. Flint property located at 8 Elm Street. Pledges were solicited and a Board of Trustees of "The Building Fund of St. Matthew's Lodge" was created in accordance with a By-Laws amendment. After several negotiation difficulties, these Trustees were empowered on October 30, 1922, to purchase the property and to borrow $9000 to accomplish this transaction. A Masonic Club was organized in November 1922 which occupied the Flint property, paid rent and assumed all obligations for utilities and alterations under $500. The 1920s also saw the start of the era of talks and lectures after Lodge meetings. Smoke Talks were also held as separate functions. Ladies Nights became annual functions and the Andover Chapter of the Order of Eastern Star was formed in 1922. The Fraternity was extremely active and the membership rolls expanded as a result. The Centennial of St. Matthew's Lodge was observed over a three day period. Approximately 175 members of the Lodge attended Divine Service at the Free Church on December 10, 1922. A Special Communication was held on December 11 to celebrate the 100th anniversary of the granting of the Charter; Grand Lodge officers were received and approximately 170 people enjoyed a banquet following the meeting. Post-prandial exercises included speeches by the presiding Master, Wor. Bradford, the Senior Grand Warden, Master at the time of the 75th Anniversary, Wor. David, a poem by Wor. Marland, history by Wor. Odlin and speeches by the D. D. G. M. and the Grand Master - grandson of a former member of St. Matthew's Lodge. The third day of the celebration, December 12, was marked by a banquet, social hour and entertainment and dancing in the Town Hall; this event was attended by about 400 brethren, friends and their ladies. The Building Trustees reported in April 1923 that tentative plans had been prepared for a new Masonic building on the Flint property which would provide for Lodge quarters and a club home. The total price for these plans, including the purchase of the property, was $75,000. By September of that year $42,000 had been raised but subsequent fund raising efforts fell short of the goal and the plan was never consummated. As a result of the Depression, the number of candidates dropped off sharply in the mid 1930s; the Relief Committee also received many applications for employment for consideration and assistance during this period. In an attempt to stimulate membership and activity, a proposal was made at the June 11,1934, meeting that a member wished to contribute $175 to defray expenses for a Watch Night (New Year's Eve) Party to be held at the close of 1934. Each married member would receive two admissions, single members, one, with additional tickets available at 50 cents each. The proposal stated that if the event proves to be successful, funds will be available for future years. The party was held on December 31,1934, at the Town Hall and 180 people attended; it was deemed a success and four new members were brought into the Lodge during the following six months. Wor. William Allen identified himself in June 1935 as the sponsor of this event and another successful affair was held in 1935. By the late 1930s the Lodge membership rolls again started to show an increase maintaining a trend which continued for about 20 years. During the 1940s the use of visiting degree teams for third degree work became quite prevalent. Most of these represented groups or clubs from businesses where the candidates were employed; others represented fraternal or ethnic groups. They certainly added interest to the meetings and provided a welcome respite for the regular line officers as well as the sideliners. The largest communication of St. Matthew's Lodge, from an attendance standpoint, was held in the High School Memorial Auditorium on June 16, 1947. The previous evening, Lodge officers and members moved the necessary Lodge furniture to the auditorium and created a replica of the Lodge room on the stage. After opening of the Lodge, a procession was formed and led to the cafeteria where a tenderloin steak dinner was served to 275 brethren. Proceeding back to the auditorium over 300 brethren observed three third degrees performed under the direction of Wor. Calvin E. B. Metcalf. A Special Communication was held on December 11, 1947, to observe the 125th Anniversary of St. Matthew's Lodge; Grand Lodge officers were present. The group formed a procession and went to the Andover High School cafeteria, where they were joined by others and partook of a Banquet. Rt. Wor. Malcolm B. MacTernan, the only living past D. D. G. M. at the time, reviewed the history of the Lodge as part of the post-prandial exercises. Entertainment, consisting of music and a magic show, was presented after the speeches; dancing followed. In 1951, Grand Lodge adopted the policy of awarding 25-Year pins to those members who had reached the quarter century mark. At the meeting of September 24,1951, 87 of the 234 brethren eligible to receive this pin were in attendance; the remaining members received theirs through the mail. By the end of 1951, a total of eight 50-Year Veterans Medals had been presented to members of St. Matthew's Lodge. During the mid 1940s, several offers to purchase the Elm Street property had been received and refused, but, in October 1948, the subject of disposing of that property was brought up before the Lodge. Questionnaires had been sent out in advance and of the 80 replies received, the consensus was 2 to 1 to sell the property because extensive repairs were needed with no funds for those repairs. Further, the income from the Building Fund was barely enough to pay the taxes and insurance. The thought of a new Temple was brought up, but no action was taken. At the conclusion of the meeting, there was no apparent resolution; a subsequent meeting between the Lodge and the Square and Compass Club indicated that the repairs could be made without any undue expense to the Lodge. In 1955, the Building Trustees of St. Matthew's Lodge took over complete control of the Square and Compass Club and the old Flint property, since the Club had become incapable of financing the upkeep and care of the building. May 1952 saw the first increase in dues since 1890 - from $5 to $7 per year. This increase resulted from an increase in the rent charged by the Bank for the Lodge Hall on the third floor of their building. The Lodge furniture was reupholstered in the early part of 1955 and a Mosler safe was purchased for the safekeeping of the Lodge records and archives the following year. As early as 1956, a concerted effort was initiated to acquire a new Lodge hall. In May of that year, a committee was appointed to meet with the Building Trustees to investigate the purchase of the Crystal Ballroom in Shawsheen. Another party purchased this facility before any action could be taken. Discontent grew over ownership of the Square and Compass building and after a long discussion at the March 9, 1959, meeting, it was voted that a motion be printed in the next notice for balloting in April that the Building Trustees be empowered to sell the facility. The vote was finally conducted in September and the motion was defeated, 56 to 14. Two years later, discussions were held to identify requirements for a new Temple. Finally, on September 9, 1963, after many months of effort by several individuals, the Building Trustees presented a plan whereby the Lodge could obtain a new facility. This plan involved a swap of the old Flint estate for a new Lodge building to be erected on the back portion of that land. The purchasers of the property, Bros. Phideas Dantos and John L. Davidson, originally offered to buy the property outright, but Wor. Bro. William D. Mclntyre conceived the "Yankee Swap" arrangement presented at the September meeting. The concept was approved, groundbreaking exercises were conducted in November 1963, and formal Grand Lodge cornerstone laying ceremonies were performed in the rain on June 13, 1964. The last meeting in the bank building was held on December 14, 1964. The first meeting in the new facility was held on January 11, 1965, but the third degree dinner for that evening was served to 197 brethren at the Free Christian Church because the kitchen facilities were not ready. Dedication of the Masonic Temple took place on April 28, 1965, and was preceded by a dinner for 200 persons in the banquet hall. The Grand Lodge officers, under the direction of Most Wor. A. Neill Osgood, performed the dedication services; Rt. Wor. Carleton E. Shulze was the presiding D. D. G. M. for the Lawrence 11th Masonic District. Plans for the 150th celebration were started shortly after moving into the new facility - funds were set aside yearly to cover the affair. Formal committees were appointed in September 1969, with Wor. Herbert W. Moore, Jr. as the overall chairman. 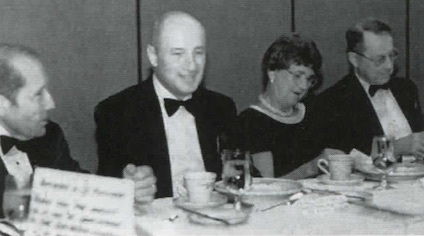 The first in the series of events to celebrate the sesquicentennial - a dinner and dance - was held on October 6, 1972, at the Andover Country Club. Over 175 brethren, friends and wives attended including the Grand Master, Most Wor. 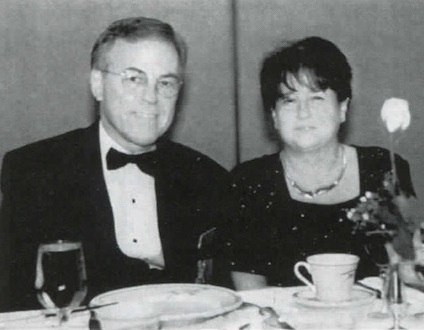 Donald W. Vose, and his wife. Wor. Robert A. Domingue served as the Master of Ceremonies for the evening. Music was provided by the John Charles Orchestra. An Anniversary Service was observed at the Andover Baptist Church on Sunday evening, December 10, 1972. The Anniversary Communication was held the following evening and was highlighted by a Fraternal Visitation by Most Wor. Donald W. Vose and the presentation of 50 Year Veterans' Medals. Over the past quarter century, the members of St. Matthew's have been staging events of interest to all the brethren as well as to potential new-comers to attract and maintain a strong membership. The events have included a myriad of themes and audiences and have ranged from Fraternal activities such as Sideliners Night, George Washington Birthday Celebrations and Table Lodges to Little Dances, Cabarets and Showtimes. A picnic was held at the Andover Recreation Park in June 1973, a fishing trip attracted members six years later. A Friendship Ball was sponsored at the Indian Ridge Country Club in April 1985. Since 1977, each December Regular Communication has been adjourned to a Christmas party for members and their spouses; in 1992 Steve Corthell's wife, Patti, started a cookie swap at this event which is repeated yearly. St. Patrick's and St. Andrew's Nights proved to be quite popular for a number of years. As the times have changed, the various committee members have attempted to mold the entertainment to attract the maximum attendance. The primary purpose of these activities, obviously, was twofold - to provide entertainment and to provide revenue. The financial status of the Lodge was also bolstered in the late 1980s and early 1990s by thoughtful brethren. In 1986, two years before he passed away, Wor. Henry Neunzer donated $5,000.00 to be used as an emergency fund by the Lodge for those unplanned expenditures that "cannot wait". The purpose of the fund stated that the amount spent would be replaced so that the total would remain ready for the next emergency. This fund has served some very worthwhile functions. At the Annual Meeting of 1978, Bro. Sid White was quite active in the suggestion process of identifying ways to raise money - little did the attendees realize the role he would play in the financial status of the Lodge through his will following his death in 1983. The Lodge was notified in 1986 of an initial amount of about $5,000.00 which Bro. Sid had left to the Lodge - this was used to establish an Education Fund, the interest from which has been used to purchase books for the Lodge and for donations as part of Masonic Awareness. In 1991, the balance of his will allocation was made known to the Lodge and that $ 161,000 was used to amplify the Permanent Fund to establish an active financial program for the Lodge. These generous brethren and the financial acumen of the Lodge members are helping ensure the viability and continuity of St. Matthew's Lodge for many years. The Lodge activities over the past few decades have included several functions intended to promote Masonic Awareness. St. John's Sundays were an annual occurence until the late 1980s when public sentiment evidenced a lack of knowledge and understanding. In 1989, the event was cancelled when the Officers were not permitted to wear their collars and Masonic regalia. A subsequent celebration was marred by the distribution of Anti-Masonic pamphlets following the service. An Open House in 1989 also suffered from the minor Anti-Masonic wave emanating from the South in that there was only one visitor to the event. St. Matthew's Lodge has marched annually in the Memorial Day Parade since 1983 and participation was strongly encouraged by Wor. Al Herling during his term as Master in 1987. The Andover Council, Knights of Columbus, and St. Matthew's Lodge joined forces in December 1973 to sponsor a dinner for the aged in town. The following year, the two organizations sponsored a Christmas Party for the elderly. When the Elm Green Park was dedicated in November 1995, the Masons of St. Matthew's Lodge were proud to know that it was their donations that purchased the flagpole which served as the focal point of the park. The Lodge participated in the early Andover Town Relays in the 1990s and joined with Grand Lodge to provide a marching unit for the 350th Anniversary Parade in 1996. Fraternity Nights have become an annual event since their inception in 1977 and provide an excellent source of potential new members. Through careful foresight, individuals who might wish to become Masons are invited to this mutual observation evening. Many of the Lodge officers of the 1980s and 1990s were introduced to St. Matthew's Lodge by this function. The By-Laws of St. Matthew's Lodge underwent a major revision/rewrite in 1988 following the initial bequests mentioned above. One of the major thrusts of this revision was to establish a Corporation to maintain the physical property of the Lodge as a wise business maneuver. The Saint Matthew's Building Association, Inc., was formed in 1989 complete with its own elected officers and set of By-Laws; it has been operating as a responsible organization since that time. Another By-Laws revision was prompted in 1992, and a Finance Committee was established to replace the Permanent Fund Trustees. This action has ensured active monitoring and control of the Lodge funds. Throughout this period, the Service Committee, the Building Trustees, the Lodge members and SMBA, Inc., have kept a watchful eye on the condition of the Lodge Building and have provided the proper upgrades and maintenance when required. Curtains, candidates attire and aprons were procured in 1977; the Lodge Room was painted in 1979. New lights were installed in the banquet hall in 1984 and then again in 1997, the latter as a donation to the Lodge by a faithful member. The lights which illuminate the third degree carved emblems were installed in 1988, also a gift to the Lodge. The roof was repaired in 1985 along with the exhaust fan system and, the heating system was converted the following year. New Officers Aprons were purchased in 1986 and the Officers jewels were refurbished in 1997. The chairs in the Lodge Hall were re-upholstered in 1994 and new chairs were acquired for the banquet hall the previous year. The present condition of the facility demonstrates that the members are proud of their Masonic Temple and the mission which it serves. Plans for the 175th Anniversary were initiated in earnest as early as May 1995, when it was voted to set monies aside for a proper celebration of that event. Full scale planning was initiated the following year, and the many-membered committee has worked very hard to bring forth a memorable event worthy of the occasion. The 175th Anniversary Dinner held at the Andover Marriott is the first of several events planned for the year and was held in the early fall to enhance the probability of good weather and reduce the possibility of postponement. There will be an Anniversary Communication closer to the Charter date and perhaps, other ancillary events. The present prognosis of St. Matthew's Lodge, its members, spirit and finances, lead one to believe that the Bicentennial Celebration will be staged in 2022. See you there! R. W. John Brown, M.
W. Merrill Pettingill, S. W.
W. Geo. Wardwell, J. W.
Bro. Samuel Phillips, Esq., S.
Bro. John Smith, Jr., S. D.
Bro. John Marland, J. D.
Bro. Charles Wardwell, S. S.
Bro. Edwin Farnham, J. S.
Rev. Bro. C. O. Kimball, Chaplain. Bro. John Smith, S. W.
Bro. John Marland, J. W.
Bro. Elijah L. Herrick, Treasurer. Bro. John Brown. S. D.
Bro. David Rice, J. D.
Bro. Jeremiah Hurd, S. S.
Bro. Zenas King, J. S.
Bro. Samuel S. Valpy, Marshal. Caleb S. Prince, J. W.
Israel G. Johnson, J. S.
Isaiah Merrill, Samuel S. Valpey and Edwin Farnham, Committee of Finance. Among recent lodge meetings in Massachusetts none have been more interesting to its members and guests than the Special Communication of St. Matthew's Lodge, A. F. & A. .M., of Andover, Mass., which was held in its lodge room October 28. This lodge was instituted in 1822 and, with one exception, is the oldest in the Tenth Masonic District. It is one of the old lodges that has had a continuous existence since it began. It did not surrender its charter or become dormant during the period of anti-Masonic excitement, as did many others in our state. Its members are proud of its past and earnest in support of its present. It is conspicuous by its prosperity and the social good fellowship of its members. This condition is in a good measure due to the ability and enthusiastic interest of its present Wor. Master, Brother Nesbit G. Gleason. The feature of special interest at the last meeting of St. Matthew's Lodge was the presence of the presiding masters of the lodges of the Tenth District, who came by invitation of the Wor. Master for the purpose of occupying the chairs of the officers during the work of the evening. Wor. Bro. Gleason occupied the East and the other positions were filled as follows: Wor. Bro. William H. Glover, of Phoenician Lodge, Lawrence, in the West; Wor. Bro. Edward A. Bower, of John Hancock Lodge, Methuen, in the South; Wor. Bro. John C. Haughton, of Tuscan Lodge, Lawrence, Marshal; Wor. Bro. Sam A. McGregor, of Saggahew Lodge, Haverhill, Senior Deacon; Wor. Bro. Roland A. Prescott, of Cochichewick Lodge, No. Andover, Junior Deacon Wor. Bro. Andrew C. Campbell, of Grecian Lodge, Lawrence, Senior Steward; Wor. Bro. Willie A. Trow, of Merrimack Lodge, Haverhill. Junior Steward. Other guests that assisted in the work were Brothers Fred H. Bean and George A. Gove, of Mt. Tabor Lodge, East Boston, and Rev. H. Usher Munro of Cochichewick lodge, No. Andover. Wor. Bro. Walter H. Coleman, Past Master of St. Matthew's Lodge also assisted in the work, having been assigned to his position because one of the candidates for advancement was his own son. There were 125 brethren preset representing the various lodges of the Tenth District. There would have undoubtedly been many more present if the weather had not been unpropitious, it being exceedingly stormy and disagreeable. The meeting was followed by a banquet which was fully enjoyed by all. The music of the evening was furnished by the Raymond Male Quartet. We have the pleasure of presenting our readers with a group picture of the presiding masters of the tenth district, in the centre of which is Rt. Wor. Bro. George H. Perkins, the District Deputy Grand Master of the district. At the annual visitation of St. Matthew's Lodge, A. F. and A. M., held on Monday evening, November 11th, Worshipful Master Nesbit G. Gleason was presented with a beautiful clock as a token of the high regard in which he is held and of his faithful service during the two years he has been master of the lodge. Speaker John N. Cole made the presentation speech and Mr. Gleason though taken greatly by surprise responded feelingly. As it was the annual visitation of the lodge, District Deputy Grand Master George H. Perkins of North Andover and suite made an official visit. After presenting the clock to Mr. Gleason the District Deputy was given a beautiful large bouquet. A bountiful supper was then served by Caterer Rhodes to the large gathering after which an entertainment of readings and selections by the Raymond Quartet rendered the evening a most enjoyable one. The centenary of the institution of St. Matthew's Lodge A. F. & A. M., of Andover, Mass., the oldest Masonic lodge in that section, was observed Sunday, Monday and Tuesday. Dec. 10, 11 and 12. 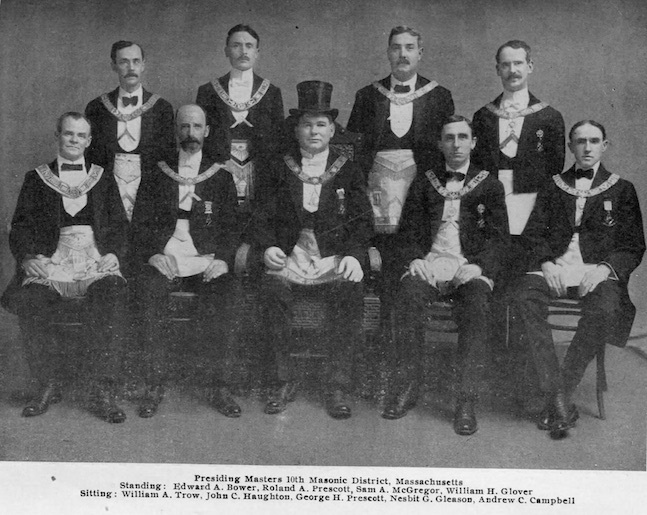 Most Worshipful Arthur D. Prince, Grand Master; Right Worshipful Dudley H. Ferrell, Deputy Grand mMster, and other officers of the Grand Lodge, including Right Worshipful Charles A. Stone of Lawrence, Deputy of the 11th Masonic District, were guests at the anniversary celebration in Masonic Hall on Monday night. Sunday the lodge attended divine services in the Free Christian Church at 10:30. The sermon was delivered by Rev. Arthur S. Wheelock, pastor and a member of the Craft. There was special music by the choir, directed by Edwin C. Booth, organist and choirmaster. Monday night at the anniversary meeting addresses were delivered by the Grand Master, deputy grand master and others, including Thos. David, master at the 75th anniversary proceedings. The historical sketch, prepared by Past Master George M. R. Holmes, was delivered by William Odlin. The banquet Tuesday night in Town Hall for members and their wives attracted 500. There was a program, with dancing. Worshipful Master Roy H. Bradford was chairman of the celebration and was assisted by Past Masters William A. Allen, Henry A. Bodwell, George M. R. Holmes ami Albert W. Lowe, and Senior Warden Alexander Morrison. St. Matthew's Lodge was instituted in the North Parish Dec. 11, 1822, and is the only one in the district organized before anti-Masonic days, which did not surrender its charter. In the records of the first communication is the information: "The lodge met for the first time Jan. 25, 1823, at widow Mary Parker's. North Andover. Signed. Daniel Wardwell, secretary." The lodge continued to assemble in the North Parish until 1826, when it was moved to the South Parish, or Andover proper. The first officers were David Rice, Worshipful Master. John Brown, Senior Warden; Merrill Pettingill, Junior Warden; Peter French, Treasurer; Daniel Wardwell, Secretary; James Shedd. Chaplain; Thomas Spofford, Marshal; George Wardwell, Senior Deacon; John Smith, Jr., Junior Deacon: Joseph Greenleaf, Senior Steward; James Roberts, Junior Steward; James Parkinson, Tyler. There have been 38 masters, of whom 19 are living. They are Joseph R. Parlin, Right Worshipful Albert S. Manning, George W. Chandler, Walter H. Coleman, James Anderson, Thos. David, Harry A. Ramsdell, William A. Allen, Charles L. White (Los Angeles), Nesbit G. Gleason (Cambridge), Henry A. Bodwell, Chas. N. Marland, Herbert S. Stillings, George M. R. Holmes, Gordon R. Cannon, Malcolm B. McTernen, Walter H. Thompson, Albert W. Lowe and Roy H. Bradford. The present membership is nearly 400. Two new organizations have been formed, Andover Chapter, O. E. S. with an enrollment of 150, Andover Masonic Club with 200 members. Miss Alice S. Curtis is the first worthy matron and Hoy E. Hardy is president of the club. St. Matthew's Lodge has purchased the Flint homestead on Elm Street and will raise funds fuo a Masonic temple. The building is being remodeled for the club, and the opening will be the first of the year. The present Officers are Roy H. Bradford, W. M.: Alexander Morrison. S. W.; Harry Sellars, J. W.; George M. H. Holmes (P. M.), S.: George A. Higgins, T.; Dr. Malcolm B. McTernen, M.; Dr. Albert E. Hulme, C: Dr. Elwin D. Lane. S. D.; Charles T. Gilliard, J. D.; Roy E. Hardy, S. S.; William D. Mclntyre. J. S.; Philip Lowe, I. S.; Horace C. Bodwell, Tyler. 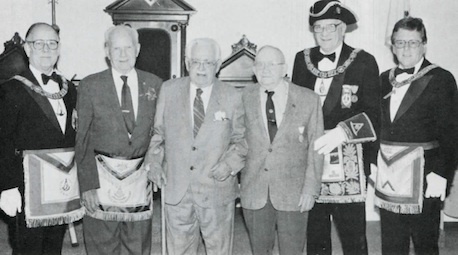 Pictured are three of the "old timers" who were honored in St. Matthew's Lodge, A.F. & A.M., in the Masonic Temple, High Street, Andover, MA, when the Grand Master, M.W. David B. Richardson, paid a visit to the Lodge to commemorate 187 years of Masonic membership. Wor. Edwin R. Walkup, the Master of the Lodge. Not pictured are Bro. James R. Carter, a 61-year member, and Wor. Harrison E. Brown, with over 50 years of service to DeMolay. TROWEL adds congratulations to these distinguished brothers who gathered on May 14, 1984, to receive the plaudits of their brethren. Bro. Gary John Conrad: Wor. Stephen A. Corthell, Master: M. W. David W. Lovering, Grand Master; and Bro. Thomas William Leavitt. illustrious Lodge conferred the Master Mason Degree on Bro. performed the actual Raising, and many other esteemed Masons took part in the ceremony. St. Matthew's Lodge of Andover recently celebrated the 175th Anniversary of the granting of their Charter by Most Worshipful John Dixwell in December, 1822. 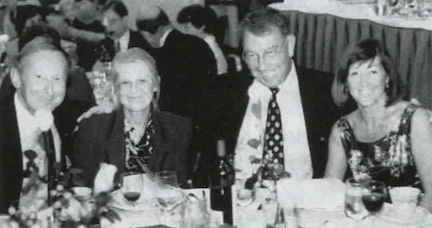 Several years of planning were culminated by a Dinner Celebration held at the Andover Marriott on September 20, 1997. This early date was selected to enhance probability of good weather for the occasion. The Lodge later held a Special Communication on the evening of January 22, 1998, to commemorate the 175th Anniversary of the first meeting held at Widow Mary Parker's (Tavern) on Chestnut Street in North Andover. Rt. Wor. E. Eric Erickson; Rt. Wor. Frank G. Holt, HI; Mrs. Holt and Rt. Wor. Paul Rolston. The Anniversary Celebration Dinner was well attended by members of the Lodge and their ladies as well as several guests including the Town Manager and Selectmen. Four special guests were Derek and Betty Holden and Peter and Mercedes Waters from Andover, England, who were able to attend to represent the five Lodges located in that town. Wor. Bro. Holden is the immediate Past Master of Andover Combined Services Lodge No. 8300 and Bro. Waters is a member of The Saint Hubert Lodge No. 1373. The Grand Lodge of Masons in Massachusetts was represented by R. W. Frederick H. Schulenberg, Junior Grand Warden, Acting Grand Master; R. W. Paul W. Rolston, Grand Secretary; R. W. Louis A. Harmon, Grand Marshal and their wives and R. W. E. Erik Erickson, Grand Pursuivant; R. W. Frank G. Holt, III, D. D. G. M. Lawrence 11th District and a member of St. Matthew's Lodge was also in attendance with his wife. Wor. Robert A. Domingue, Secretary of St. Matthew's Lodge, was the Master of Ceremonies for the evening. Following dinner, the Chairman of the Planning Committee, Bro. James H. Brown, Senior Warden, was presented a certificate for his efforts and the presiding Master, Wor. Douglas W. Cornell, and the D. D. G. M. were called upon to speak. Wor. Bro. Derek Holden of Andover, England, brought the Fraternal Greetings from the Lodges and Masons of that town to the members of St. Matthew's and delivered a few fine comments. Bro. Domingue delivered a synopsis of key events in the 175 years of St. Matthew's life and the Acting Grand Master brought the best wishes of the Grand Master and the Grand Lodge as well as a few words of his own. Bro. Peter Waters, Mrs. Waters, Wor. Derek Holden and Mrs. Holden. A commemorative booklet was prepared for the evening which contained a brief history of the Lodge. Unique design St. Matthew's Lodge pins were presented to every Mason present and a pewter bud vase with the same pin attached to its base were provided to the women. All members and guests present, numbering almost 200, agreed that it was a fitting way to honor the healthy continuous existence of St. Matthew's Lodge.